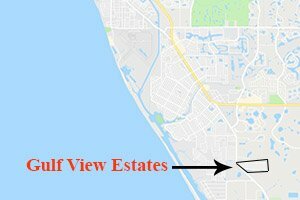 Gulf View Estates is a large residential development in Venice east off of Englewood Road (State Road 776), less than 2 miles south of the Tamiami Trail (U.S. 41). Its adjacent neighbors include Pennington Place to the south and Ventura Village to the north, equally potent destinations for prospective buyers of Venice homes for sale. The new market entries in the Rapalo community by the Express Homes unit of D.R. Horton is likewise on Gulf View Estates’ northern periphery. The acreage of Gulf View Estates has been developed and platted quite well. Neat spaces separate each of the property’s home sites totaling 370 lots, which were all set for single family homes. Open areas and greenbelts likewise delineate each of the community’s various sections. The property features two street corridors on its northern and southern edges—Roosevelt Drive and Pierce Drives, respectively—to which 14 other internal streets link perpendicularly. Washington Drive fronts the community towards SR 776 where its main entrance is located. The property further exudes charm in its natural canal connecting two lakes with fountains as their accents. A nature preserve is also adjacent east of the property, a complementary feature which attracts visits from endearing migratory birds. 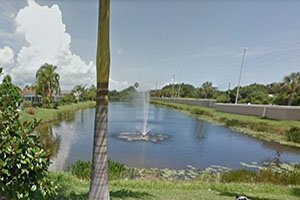 There being no onsite amenities in Gulf View Estates, except its open spaces, water features, and landscaping, the HOA fee homeowners pay is low at under $200 annually. 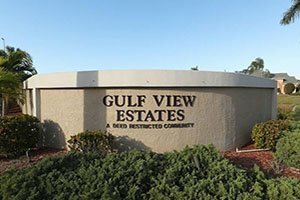 The development of Gulf View Estates and construction of its 370 single family residences commenced in the early 1980s. The community was eventually built out sometime in the early 2000s. Covered by deed restrictions, Gulf View Estates’ residences are single-story designs mostly rendered in the Mediterranean Revival and Sarasota Modern architectural styles. Diverse selections are typically available on listings of Gulf View Estates homes for sale. Their features can include such extras as mother-in-law apartments, covered swimming pools, play areas, and pretty gardens. The hot picks in this community are those later builds in the 2000s which typically come onto the market of Venice homes for sale with price tags in the $200s‒$300s range. Featuring two to three bedrooms with floor plans of about 2,000 square feet, these properties could be sold within a few days of their listing on the market. Buyers also grab well-priced Gulf View Estates homes for sale because of their proximity to the alluring Gulf Coast beaches. These nearby coastal destinations include choices on Manasota Beach, Englewood Beach, and Venice Beach. Parks and nature preserves are also part of the magnets to home hunters in this side of Venice. One popular local draw is the 200-acre Lemon Bay Park where there are trails and picnic areas amidst pine forests as well as kayak and canoe launches for bay access. Outdoor activities for Gulf View Estates residents can easily shift to golf, as the links of the Sarasota National and Venice East Golf Course are nearby as well. Retail centers have also been woven into the locality of Gulf View Estates, with the closest just north on U.S. 41 at the Venice Village Shoppes, which is anchored on a Walmart and a Publix. Below are the current real estate listings available in Gulf View Estates.